I don't know about you but eventually I am going to print out my blog and make a book out of it! I'm sure one day my kids or whoever reads it (or attempts to) will think I am a crazy lady obsessed with my husband and our chihuahua haha! 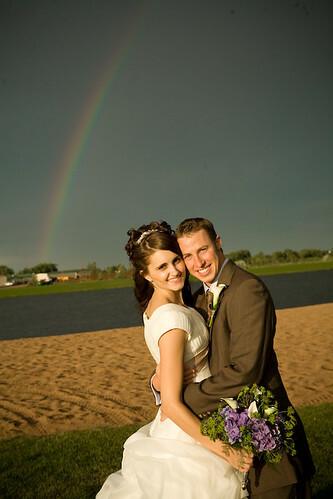 With that said, I am sharing a guest post I did for Hayley over at The Newlywed Pingrees this June of 2011; it is riggghht here! It was also my first guest post ever so I was really worried if it was good enough and was worried it was too long haha. Fun stuff...read on if you like weddings! PS. Check out her blog because I love it and wish we were bffs. Hey lovely readers of The Newlywed Pingrees! Today I am going to tell you a little about my wedding including what I wore and a special moment. 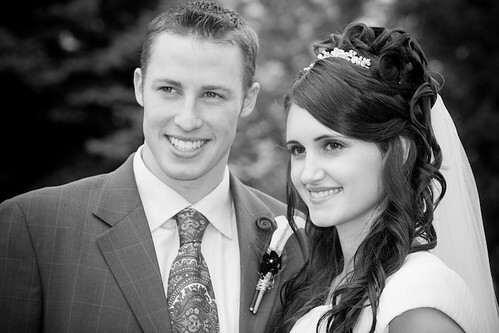 My husband is Kevin and we were married almost 3 years ago on August 8, 2008. 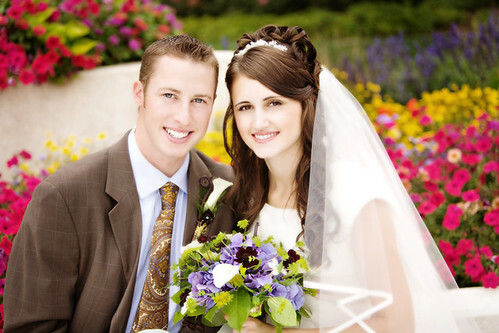 We were married in the Denver, Colorado LDS temple for time and all eternity. In case you are wondering the date is 08.08.08 which according to the Chinese culture is a very lucky day to be married! Because Kevin and I were engaged on June 3, 2008 and married on August 8, 2008 we didn't have a lot of time to plan the wedding. I was attending Brigham Young University in Provo, Utah at the time of the engagement which means there are a lot of wedding dress stores in the area. My mom flew into town and we started looking around. We found out that for the majority of wedding dress stores you needed to buy a dress at least a few months in advance of the wedding so you could order the dress and do multiple fittings. I definitely did not have 4 or 5 months! Plus after spring term at BYU I was going to be living back home in Colorado so multiple fittings would be almost impossible. My mom and I went into Allyse's Bridal at the University Mall because they had dresses in different sizes so you wouldn't need to order one. I thought I knew exactly what I wanted and when my mom suggested the dress I didn't want to try it on. Honestly, I didn't really like the dress. She basically told me I should try it on just to see, so I did and I am glad I did! As soon as I tried it on I fell in love with it! My mom loved it too and I am so glad that she pulled it off the rack and made me try it on! I chose to get it in ivory instead of pure white. 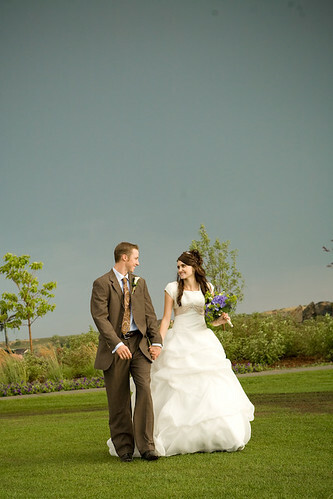 I liked how it was a little different than other typical LDS wedding dresses. One of my favorite parts of the dress is the back. Some details: My dress, veil, and headpiece were all from Allyse's Bridal. My diamond earrings were from Nordstrom. My light blue shoes were Anne Klein from Zappos (not pictured). I wore Bare Minerals makeup done by myself. My favorite hairdresser in Fort Collins, Colorado (where I am living now) did my hair really early the morning of the wedding. So there you have it! PS. OH and Hayley & I did meet at the Utah Blogger Meet Up so we are real life friends! AND sooo excited I will be having a new blog design soon!!! Eeeek! And an ah-mazing giveaway will be up on Monday! and your dress was beautiful! First off, you look beautiful! Such a pretty bride :) I love wedding posts! We had a super short engagement too! Luckily, all the dress stores in AZ you walk out with the dress you try on. That's weird that they don't offer that in Utah!!!! And, I'm working all weekend! But we are going to the temple lights on Saturday so I am excited! Wow, your dress is so beautiful! I thought I knew what I wanted too, but I ended up choosing something completely different! OH my goodness! Soooo beautiful! I love wedding pics. Your dress and flowers are truly swoon-worthy. Very elegant and classic, and I like how your hubby wore something other than a tux. :) Have a great weekend! I'm going to try to stay warm! It's freezing here! My wedding dress ended up being a style I didn't think I liked until I tried it on. Crazy how that works! Your dress is beautiful! how fun :) your pictures are gorgeous! You were a beautiful bride! I love reading wedding posts! P.S. I am TOTALLY planning on making my blog into a book as well! If nothing else it will tell a little bit of my life story! your dress is absolutely beautiful. YOU are absolutely beautiful! you were so close to getting married on my parents' twentieth anniversary! they got married august 5, 1988. Your dress is so perfect on you. How crazy that you didn't even like it at first! Aww..you were beautiful on your wedding! 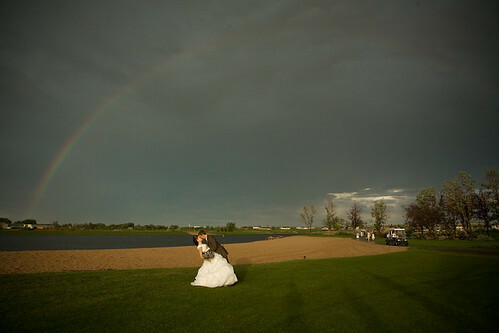 VERY cool that you had a rainbow on your wedding day! I love how unique your dress is, and you look beautiful! You and the hubs were definitely meant to be! This is simply lovely. I loved it! My fiance are getting married in the salt lake temple. My friend has got some really pretty modest wedding dresses like yours and its simply beautiful. I cant wait to get married as well. Thank you for this blog its really good and pretty!